Over the past few school years we've been fairly hit and miss with spelling and vocabulary. Amber has loved spelling since first grade in parochial school, but once she began middle school our formal spelling lessons dwindled in favor of occasional root word vocabulary. We still couldn't decide how to handle spelling for this eighth grade year when we were offered the chance to review Phonetic Zoo Spelling Level C [Starter Set] from Institute for Excellence in Writing (IEW). Again, IEW came through with a fantastic amount of material included in their starter set for Phonetic Zoo Spelling. We received the six CD physical set for Level C, the set of large flash cards, and the Spelling Zoo Cards. With this starter set also comes a free download of the Level C MP3 audio files, the Phonetic Zoo Teacher's Notes e-book, and the video Spelling and the Brain by Andrew Pudewa. Phonetic Zoo Spelling is a mostly self-teaching spelling program available for grade school through high school. It is based on the Blended Sound-Sight Program of Learning designed by Mrs. Anna Ingham which includes a multi-sensory approach to language arts. Although it does include spelling rules, they are used more to help the student see the pattern than as a memorization item. The Phonetic Zoo Teacher's Notes e-book is used for all levels of the curriculum with specifics for each level noted in the lessons. The Teacher's Notes explains how to easily setup and store these spelling lessons, as well as detailing the possible lesson schedules. A single page is then devoted to each lesson and includes the topic, an introduction and hints for presentation, the rule, jingle or hint for the topics, discussion points, and a word list for each level. There are also word facts and trivia in each lesson that the teacher and students may find interesting. The large flash cards in the starter set are also used for all levels of Phonetic Zoo. The front, which is shown to the student, displays the lesson number, animal pictures with their name (these fit the lesson topic), and three words from each student level. The back of the flash cards include the topic, the rule, jingle or hint used to help the student with memory, and then a word list for each level. The front of the Spelling Zoo Cards show the topic and the animal & name from the lesson. The back again has the rule, jingle or hint from the lesson. The students are given these smaller Zoo Cards to keep. However, the bulk of this product is the lesson CDs (or MP3s). For level C this includes six CDs which cover 47 lessons and a final exam. It is recommended the student listen to the lesson with a headset to ensure clear and undistracted listening. The audio lessons contain various repetitions of the rule, jingle or hint along with a word list appropriate for their level. The student uses the audio lessons to take a spelling test over the current word list every single day. Even on the first day of a new lesson the student will attempt to spell all the words, and then is given a second auditory track to assist in checking / correcting those words. The length of time a student spends on any given lesson depends on their mastery of the concept and word list. 100% on the spelling test must be achieved two days in a row in order to move on to the next lesson. The goal should not be to race through the lessons, but to learn the concepts and words. Starting off, how do you decide which level of Phonetic Zoo Spelling to use with your student? IEW provides easy to complete and fairly short placement exams to help determine where your student needs to begin. Amber took the Level II (for 6th grade and up) and Level III (for high school) placement exams, both of which determined she should be in Level C of Phonetic Zoo. After reading through the Teacher's Notes, and of course printing and binding the e-book too, I was ready to start the first lesson with Amber. I went over the lesson flash card along with the rule. We went through the discussion as suggested in the teacher's notes, but Amber already knew that information. She then started on her portion of the lesson using the MP3 files on her iPad with pink My Little Pony earbuds. Amber commented that the word list was read rather quickly on the first lesson, but she knew how to hit the pause on her iPad so it wasn't an issue. She then went checked her spelling test, making corrections as needed. On that first list she missed a couple, however the next two days in a row she achieved her 100% on the test and was able to move on to lesson 2. Amber quickly realized the length of time she spent on a single lesson depended on her understanding. She put more effort into her tests after the first lesson and generally has only needed to spend two days per lesson. Amber also requested that I not go through the teacher / student spelling time with her. It felt awkward to her and she prefers to read the teacher information on the flash card and in the teacher's notes (without peeking at the word list) herself. She then moves right on to the test. I did give it one more half-hearted attempt, but she rebuffed me and went about with her lesson. She definitely has taken to the self-teaching and independent learning of this product. While Amber is finding Phonetic Zoo Spelling to be easier than she expected, much of this is due to the approach taken in the curriculum. Even though Amber has always done well in spelling, there is still plenty for her to learn and Phonetic Zoo is pushing her to practice those spelling skills without even realizing she's building on her phonetic knowledge. In our opinion, the quick and fun daily lessons of Phonetic Zoo Spelling from IEW are a great way to expand your student's spelling abilities and phonetic understanding. 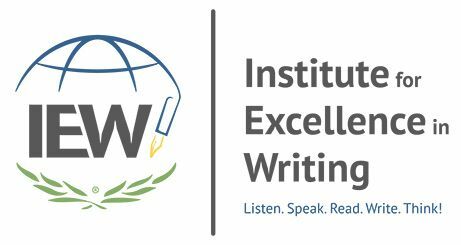 Visit other members of the Review Crew for their experiences with these IEW products!